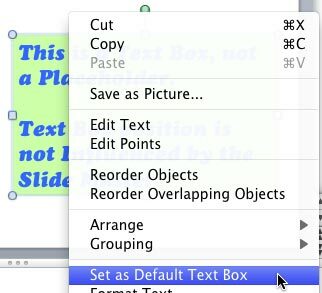 Learn how to set a formatted text box as your default text box in PowerPoint 2011 for Mac. You might have made all formatting changes to a text box such as setting Autofit options, tweaking margins, etc. At this point of time, you are so happy with your settings that you want to use the same settings for any other text boxes you will add within the same presentation. The good news is that you most certainly do not have to change all settings again for all new text boxes. There are two ways of making new text boxes possess the same settings as the older one -- the first option is to use the Format Painter option to copy attributes from the original text box to the new text box. This option works great as long as you only need to insert one or two more text boxes since it does involve repeated clicks -- look at our Copying Text Attributes with Format Painter in PowerPoint 2011 for Mac tutorial to learn more. Add a solid fill to the text box (which is similar to adding a solid fill to a shape). Click on the edge of this text box so that it shows a solid line with selection handles on its perimeter (see Figure 1) to indicate its selection. Now, carefully right-click on the solid line to bring up the context menu shown in Figure 2. From this menu, select the Set as Default Text Box option. Tip: Cannot find the Set as Default Text Box option? Make sure you have selected the entire text box before you right-clicked. You must select the edge of the text box so that the entire text box is selected without selecting any individual text. If you still do not get the Set as Default Text Box option in the right-click menu, then you might have selected a text placeholder rather than a text box -- read our Text Boxes vs. Text Placeholders tutorial to understand how they are different. This will set the selected text box as default text box. From this point onwards, each new text box that you place within that presentation will utilize these newly established parameters.